The first time I made Kenya and Chloe my Mexican Rice Balls they got a major thumbs up from them. It's such a simple recipe at that -- savory spheres of rice stuffed with a chunk of sharp cheddar which melts inside, creating a gooey center that brightens your day when you take a bite. Since then, whenever I make my family a batch we finish them all in one sitting without fail. I got to thinking about what other foods you could stuff with a morsel of oozy gooey cheese. Chloe adores turkey meatballs and since they are so easy for little hands to pick up and eat, I whipped up a test batch and tucked away a cube of cheddar in each one. Voila! 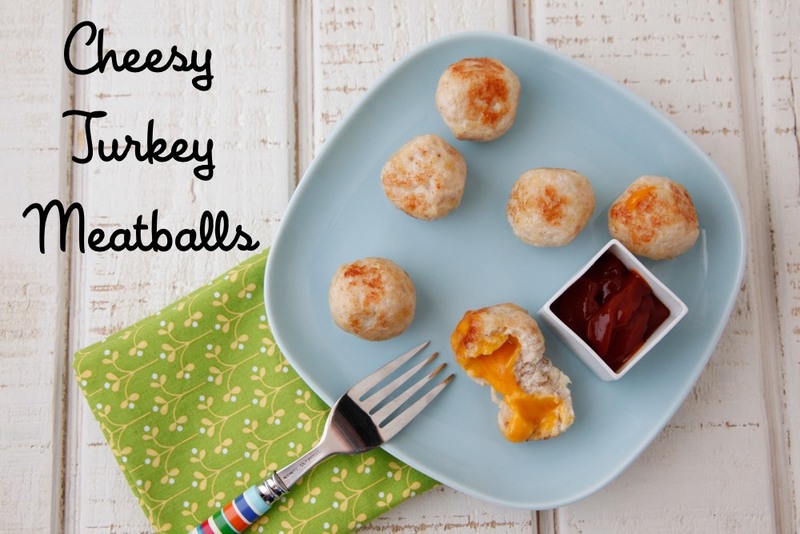 Cheesy Turkey Meatballs were born! I did all the prep work in the morning, so all I had to do was sautéed them up minutes before dinner and serve them with a simple side of pesto pasta. One important note_ always make sure to cut into a hot cheesy turkey meatball before you serve it to your kids. You definitely don't want any burned tongues! So much cheese across the web. Check it out! 1. In a bowl, combine the ground turkey, egg, breadcrumbs, garlic powder, onion powder, and salt. Mix to combine thoroughly. 2. Slice the cheese sticks into 1/4-inch cubes. 3. Using a 1 tablespoon measure, form the meat mixture into a disc, place a cheese cube in the center, and then roll the meat around the cheese to form a ball. If the meat sticks to your hands, lightly wet your hands with water. 4. Heat the oil in a sauté pan over medium heat and cook the meatballs for about 5 minutes, until the turkey is cooked through. Have you ever made them ahead and kept them in the freezer? I'd like to try freezing them, too. Has anyone tried it? Do you use ground turkey breast, or just regular ground turkey? My son is allergic to eggs. Can I omit the egg? Or what other substitute can I use? Could you bake these as well? If so what temp and duration would you recommend. I was wondering the same thing...can these be baked instead of Sautéd? If so any recommendations on temperate and cook time? Yummy! So simple! My kids would love these. We just made these and they are delicious! My daughter &amp; husband love them. I baked them at 350 for 15 minutes (sprayed a light coat of olive oil) and they came out great. The cheese did melt out of a few of them though. Have you eaten any that you froze ? Just wondering how they hold up before I make them. Hmmm the breadcrumbs help them stay together. Maybe try gluten-free breadcrumbs? If it's gluten sensitiviy, you could try gluten free oatmeal i've used oats instead of bread crumbs for burgers and meat loaf with good results.. I had some ground pork in the fridge that I needed to cook by today - I recalled seeing a link to the video on this a couple of days ago and thought the pork variety might be pretty tasty. Just got done cooking them up and could hardly wait to try one - I can confirm pork is delicious in this! I'm not typically a huge fan of \"cheesy\" anything, but this has just the right amount to make it fun. The true test will be my I Eat Nothing 7 year old - will try at dinner tonight and report back. Even if he doesn't love it, so what? More for me! my 4 year old has never really liked any kind of meat. he just gobbled up 5 of these! How many grams of cheese is used in this recipe? Just not sure what '4 sticks of cheese' is. I'm not sure about the grams. I buy those cheese sticks at the grocery... like string cheese, but it is cheddar cheese. and then I cut those into cubes. It comes out to about 1 cup of cheese cubes! Can I bake these instead of saute? That should work just fine! I would do 350F for 20-25 minutes!